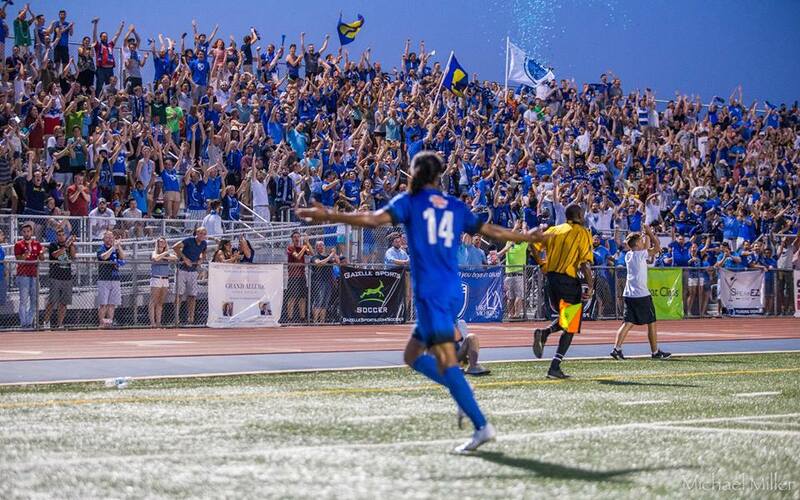 Grand Rapids are one of the many exciting clubs that call the Great Lakes conference of the NPSL Midwest home. A second place finish in 2018 handed the club a short but valuable playoff run and 2019 may find the club continuing to impress on the pitch. We connected with Matt Roberts to discuss the clubs origins, goals, and more. ﻿When and how were you founded? What leagues have/do you compete in? We were founded in 2014 and started playing in 2015. Our first season we played in the Great Lakes Premier League (which eventually became UPSL) and the last three seasons in the NPSL. 2019 will be our fifth season of play. What are the key elements of your badge and what do they mean to the club? Our badge is pretty simple and straightforward. The shield has four sections which represent the four areas of the city (SE, SW, NE, NW) and the color blue is very prevalent in our city (The Rapid, GVSU, city flag) so we decided to make royal, navy, and white our primary colors. What is your club short- and long-term goals? The short term is always to win the league championship and every cup competition we play in. We have very high standards and believe we can put a winning product on the field year in and year out. The long term goal would be to have a soccer stadium inside the city limits and a full professional side playing year round. That being said, we are focused on making the best decision for the club for the long term and won't make a move until we feel 100% comfortable with the league, the costs associated with the move, and our ability to compete at that level. Who have been your most prolific or important players in recent seasons? We have had some great players come through over our four years in existence, but I can point to a few. Goalkeeper Noah Fazekas is a fan favorite, but he unfortunately is not able to come back this year. Caleb Postlewait is a defender who can play multiple positions and dominate at each one. Greg Timmer is a force in our midfield and is coming back from an ACL injury this year. Scott Doney was a our leading goal scorer last year and has played three seasons with us. Image courtesy of Grand Rapids FC. Do you have specific rivalries; how seriously do you think the club takes those matches? I would say our two biggest rivals are AFC Ann Arbor and Detroit City FC. Ann Arbor is always battling for playoff spots and we founded the GLPL in 2015 together so we have played twice a year. Detroit City is always a great game and we have a 2-2-2 record against them in our three years playing in the NPSL. I think they are important but we take the position that every game we play is a chance to make our fans proud and want to win every time we step out onto the pitch. Lower league soccer is full of clubs that want to grow large brands and take on the spotlight, but also full of clubs that are only focused on the results on the pitch. How does Grand Rapids fit into that comparison? We are a little bit of both. We aren't necessarily looking for the spotlight, but it usually shines on successful teams. We have had the good fortune of great coaching staffs and player pools who have put us on the national map because we consistently win. We have never finished lower than third in any league we have played in and because of that success people take notice.